Catedral de Santiago de Compostela is in the north-west of Spain, not far from the Galician coast and the city of A Coruña. Construction on the cathedral began in the late 11th century, though parts were added to the cathedral as late as the 18th century. 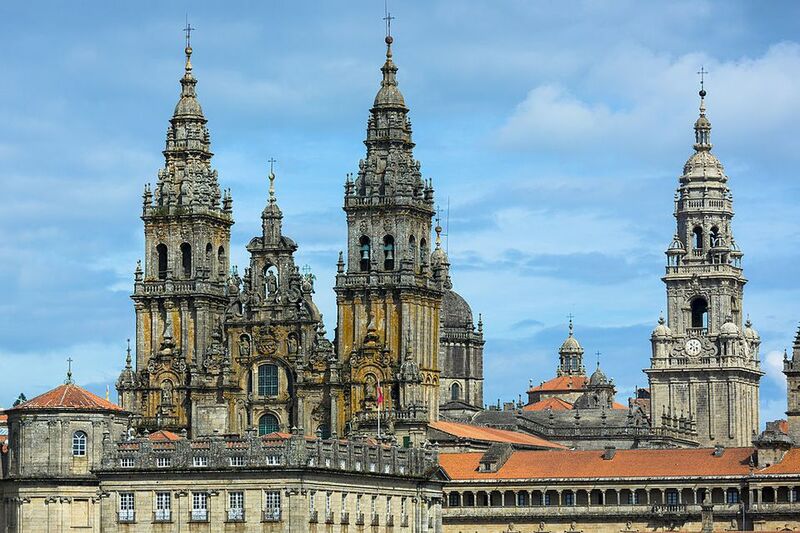 Santiago de Compostela's cathedral has a baroque façade but most of it is Romanesque. The remains of St James (Santiago) are inside. The Camino de Santiago pilgrimage culminates in a visit to St James's tomb. Basilica hours: the Cathedral of Santiago is a sanctuary that is open all year round, from 7:00 am to 8:30 pm. Cathedral Museum hours: daily from April to October: 9:00 am to 8:00 pm; daily from November to March: 10:00 am to 8:00 pm. Seville is the capital of Andalusia, Spain's most southern city. It is connected to Madrid by the AVE high-speed train. The Catedral de Sevilla It was built in the 15th and 16th centuries. The Giralda bell tower, a part of the mosque that formerly stood on this site, is from the late 12th century. The style is Gothic. The largest altar in the world, the tomb of Christopher Columbus, is inside. Entry costs ~10 euro. Leon is in the north-west of Spain, between Madrid and Asturias. The Catedral de Leon was built between the 13th and 16th centuries. The style is Gothic. About 1,500 pieces of art, including many Romanesque sculptures, live inside. Check the website for most updated open times (they vary throughout the year) and prices. Burgos is on the road from Santander on the north coast to Madrid in the center of the country. The Catedral de Burgos was built from the 13th century until the 16th. It is Gothic. The Papamoscas, a statue that opens its mouth when the bells chime, and the tomb of El Cid are inside. The Catedral de Burgos is a UNESCO World Heritage Site, the only such cathedral in Spain (other cathedrals are included in the UNESCO list along with their respective cities). Salamanca is to the north-west of Madrid, not far from the Portuguese border. There are in fact two cathedrals in Salamanca, but they are built side by side so tourists generally see them as being a single sight. The new cathedral was built between 1513 and 1733. The New Cathedral (Catedral Nueva), the more important of the two cathedrals, is Gothic and Baroque. A recent renovation has resulted in some modern aspects in the façade that should intrigue the more observant. A museum and archive, as well as a number of small chapels and naves, are inside. Entry to the new cathedral is free but a small entry fee of about 5 euro is charged to enter the old cathedral. Both are closed on Sunday afternoons from November until February. Cadiz is on the south coast of Spain in Andalusia. The Catedral de Cadiz was built from 1776 until the late 19th century. A previous cathedral was burned down in the late 16th century. It is partly Baroque and partly Neoclassical. The tomb of composer Manuel de Falla and some religious paintings are inside. Zaragoza is in the autonomous community of Aragon. It is roughly half-way between Bilbao and Barcelona. There are two cathedrals in Zaragoza - La Seo and the Basilica-Cathedral of Our Lady of the Pillar. The latter is the more attractive one, built in the late 17th century. A number of churches had existed on this site since St James saw an apparition of the Virgin Mary. A statue of the Virgin Mary, supposedly given to St James by Virgin Mary herself, is inside. The feast of Our Lady of the Pillar on October 12 coincides with the day that Columbus discovered the new world. Each country from Latin America has donated something to the cathedral to celebrate this fact. Toledo is a small city a little to the south of Madrid. It can be easily reached by AVE high-speed train. Catedral de Toledo was built between the 13th and 16th centuries. The style is High Gothic. Some excellent paintings, including one on the ceiling by Luca Giordano, are inside. There is a maze of small chapels that could occupy a visitor for hours! Valencia is on the southern part of the east coast of Spain, to the south of Barcelona. The Catedral de Valencia was built between the13th and15th centuries. The style is Gothic. The main attraction of the Valencia cathedral is the Holy Grail, or at least what is claimed to be the Holy Grail. Cordoba is in northern Andalusia (Spain's southern-most region), roughly halfway between Seville and Granada. The Catedral-Mezquita de Cordoba was built as Christian Visigothic church and turned into a mosque (Mezquita) in the 7th century. It was taken by the Christians in 1236 and was turned into a Christian cathedral. The style is Christian Visigothic with Islamic additions. The giant arches over 1,000 columns are the most interesting sights inside, as well as the Byzantine mosaics in the mihrab.